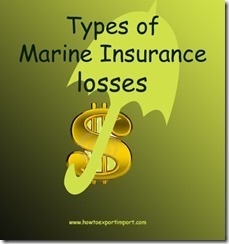 How many kinds of losses are there in Marine Insurance? What is TOTAL LOSS under Marin Insurance? How does AVERGAGE LOSS work in Marine Insurance? When does Actual Loss occur in Marine Insurance? What you mean by constructive loss under marine insurance? What does the term Particular Average Loss mean? How does General Average Loss work under Marine Insurance? In this article, I would like to discuss about different types of Marine Insurance and its subcategories. I hope, this article helps you to gain a good source of information to know about Marine Insurance in import export trade of international business. There are two kinds of marine losses. Broadly, they are TOTAL LOSS and AVERAGE LOSS. Total loss under marine insurance can be further classified into actual loss or constructive loss. 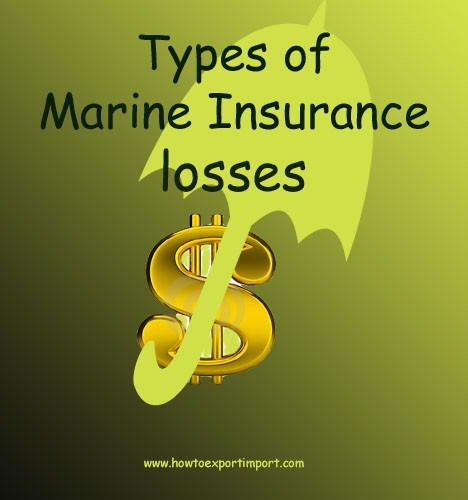 What is Actual Losses in Marine Insurance? When do actual losses in marine insurance occur? (i) The insured cargo is physically destroyed such that there is no possibility of salvage or recovery of the goods. (ii) The insured cargo is damaged that it ceases to be a thing or description insured. E.g. cement bag turns into concrete due to sea-water contact. (iii) The cargo is irretrievably lost. For example, when the ship sinks, the cargo can be retrieved only after a long time and the salvaged goods cannot be of any value to the insured. What are Constructive losses in Marine Insurance? When do constructive losses in Marine Insurance occur? (B) Constructive Total Loss can take place when the cargo is damaged to such an extent that the const of saving and repairing or reconditioning of the goods is more than the value of the goods. What you mean by Average Loss in Marine Insurance? How does Average Loss work? If loss is less than total, it is called an average loss in insurance. Average loss may be particular or general. What does Particular Average Loss mean in Insurance? How does Particular Average Loss work in Marine Insurance? There are two types of particular average losses i.e. the total loss of a part of goods and goods arrived in damaged condition. (i) Total loss of a Part of Goods: When a part of total consignment is lost, this method is applied. Value will be arrived by multiplying the number of items lost with per unit value declared in the invoice. (ii) Arrival of Damaged Goods: In case, the goods arrive in a damaged condition at the point of destination, the consignee or his agent and ship surveyor attempt to arrive at the agreed percentage of depreciated value of goods for settlement. Say, the depreciated value is arrived at 30%, insurance company will pay the balance 70% of the declared value. If both the parties fail to arrive at a settlement, the damaged goods will be sold, locally, in the open market. To arrive at the claim amount, the sale proceeds will be deducted from the wholesale value of those goods at that place and time where damaged goods are sold. The claim amount and sale proceeds are given to the insured. Auction charges and other incidental expenses have to be borne by the insurer. If the damaged goods can advantageously be repaired, the underwriter pays the repair charges to the insured, not exceeding the insured value. (B) General Average Loss: this may occur whether the goods are insured or not. It results from an intentional sacrifice or expenditure incurred by the master of the vessel to save the ship or goods from danger for the common benefit of the owners of the ship and goods. It needs to be emphasized that the sacrifice or expenditure should be made knowingly, but prudently, and in a reasonable manner. What is General Average Loss under Marine Insurance? How does General Average Loss work in Marine Insurance? (i) Some goods are thrown to lighten the ship when the ship is caught in a rough weather. (iii) Pour water to extinguish fire. When general average loss occurs, captain of the ship reports the matter of loss to the port authorities. The port authorities appoint an Average Adjuster for preparing the statement of general average adjustment and fixing the contribution to be made by the owner of the vessel and various shippers. After cargo owners make payment of their contribution, the shipping company gives delivery of goods to the concerned owners. The preparation of general average adjustment is a complex accounting operation. This job is normally entrusted to the professionally trained average adjuster (not the insurance company). This entire exercise frequently requires two or three years for completion. The average adjuster also gives a certificate of contribution to the shippers in respect of the amount of contribution, payable by different parties. The insured would be able to get the contribution certificate from the shipper, soon after payment. The insured can get settlement of claim from the insurance company, producing the evidence of contribution certificate and its payment. Also read - Terms Used in Marine Insurance, Risks not covered under marine insurance, Types of marine insurance policies Types of Insurance Documents, Procedure and Documentation for Filing Claim of Marine Insurance I hope, these article provide you a better knowlege about Marine Insurance under international business. In this article I have explained about types of Marine Insurance used under import export trade, kinds of losses in Marine Insurance with its subcategories. Do you wish to add more information about types of Marine Insurance used in international business and different kinds of insurance in marine insurance? I know, most of you have been experiencing in handling different types of marine insurance under international business. You can share below your experience about different types of Marine Insurance used under imports and exports and kinds of loss in marine insurance. Did you like this article about different types of marine insurance used under international business? Comment below your thoughts and discuss about different types of marine insurance with its kinds of losses under marine insurance. Bukky: On 03 October 2013 Goods arrived in Houston port, Clear customs and sealed. Container unsealed, Goods missing from the container, e.g instead of cooking oil . the container contains bag of unknown cements/dirt's. Who is responsible for the missing goods. Cif order. Surendran Kollerath: On 08 March 2014 Hi Bukky, Exporters at different countries have options to get export goods cleared from concerned customs department to ship goods without physical verification of goods. If any buyer/importer suspect about goods supplied, he can examine goods before import clearance. Expert can share their thoughts also on this relevant question. Sa1: On 11 June 2015 Very insightful. Thanks for posting this article. JOHN: On 14 July 2015 This article is indeed educative, well explained and explicitly arranged and categorised. God bless the author.